Well, a cold front moved through from the west about 4 pm, and it met a warm front from the south. The result was thundershowers, blinding rain, and high winds just as I was getting home from work. We had 1.37 inches of rain in about an hour and a half. Once again, there were huge puddles of water in the yard. We have had 7.3 inches of rain for the month of January. Now, the rain has stopped, and the temperatures are starting to drop. I had thought I would be able to at least do some work in the garden this afternoon before the rains came. But, that was not to be. The weather forecasters all say that starting tomorrow there will be sun and pleasant temperatures. I am looking forward to good weather for the next few days as I will be off until Thursday for the Mardi Gras holidays. I can’t wait to get outside in the sun, do some clean up work in the garden, and take some photos. As soon as I post this, I will sit down with some of my garden books and dream of warmer, drier days when I can get out and putter around in the garden. I read the following quote on Sunday, and it really made me stop and think. I wonder if what makes people come alive is their avocations. I know there are some people whose vocations make them excited and alive, but, for most people, they can’t wait to retire. As I read the many garden blogs that I visit, I am struck by the fact that so many people are very involved with their gardens. They seem genuinely interested in what they and other gardeners are doing. They seem to enjoy their plants, sharing information, and inspiring and encouraging others. It seems as if their gardens bring them such joy, and this is what makes them so alive. Most gardeners do not stop at just gardening. Their interests soon expand to photography, books, travel, etc. It is a shame that more people cannot find this enthusiasm for something in their lives because the world truly needs them. So often when we garden, we only see the close up view and not the big picture. I realized this one spring day about three years ago. I walked across the street to talk to one of the neighbors, and I just happened to glance back at my property. I was shocked at how great the side garden looked. The azaleas were in bloom, the arbor looked perfect, and the flower beds were looking their spring-time best. It was everything I wanted my garden to be. I was also able to see where things were needed. How the colors of one bed needed to be extended across to another one, and how one side of the house had more plantings than the other. Another thing I had to reconsider was how some of the garden did not flow together; some of the beds were just too separate. Since that time, whenever I step back to see how things are looking, I do not just look from 10 – 20 feet away, but now move across the street to see how things are shaping up. Now that I have a digital camera, I will be taking pictures because many times pictures make us see things differently. Sometimes it is a good idea to see our gardens as other people see them – from a distance. As I have said before, in the last few years, I have wanted to have in my garden plants that my mother or grandmothers had in theirs. Plants that I planted last year for the first time were Easter Lilies. I remember as a small child that my mother had a bed of them. I bought about 25 bulbs from Brent & Becky’s and planted them in early April. They sprouted up immediately and bloomed in late May to early June. They usually bloom a little earlier than that here, but I planted them a little late. They did not last quite as long because of the heat, but I was satisfied with their performance. Since I never have grown lilies before, I did not know what to expect. Last summer they grew like crazy. The plants got big and lush. In late October, they were still going strong – no going dormant or dying back. One of my friends, whose relatives grew Easter Lilies in the 1950’s for commercial growers, told me I needed to cut them back so they would go dormant. I did cut them back, but it seemed like in no time at all, they were growing back up. They are now about 10 to 12 inches high. I am looking forward to what they are going to look like this spring. In driving around the older neighborhoods, last year, I was pleasantly surprised to see these old-fashioned flowers growing in people’s gardens. It sure did bring back pleasant childhood memories. The last two weeks have been cold, bleak, and rainy, but today was a totally different story. By mid morning the sun was out, and the sky was clear, and the temps were in the low 60’s. Even though the grounds were still wet, I was able to get out and take a good look around. 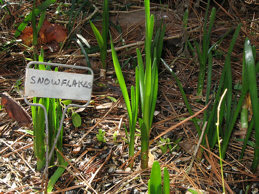 I was surprised to see that the signs that spring is on the way were beginning to show all over the garden. What were some of those signs? The summer snowflakes have popped up. 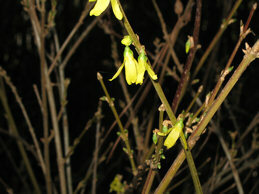 The forsythia has started to bloom. 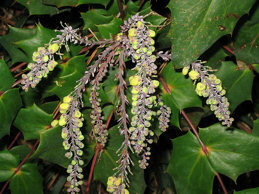 The leatherleaf mahonia is blooming. The Mount Hood Daffodils are showing buds. 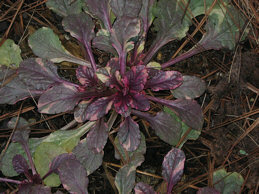 The Burgundy Glow ajuga is coming alive. And, finally, the Nun’s Orchid bloom stalk is shooting up. I know that we will still have some cold days. After all, our last day for frost is usually around March 1st. But, I can’t help but be encouraged by these signs that tell me that spring can’t be too far away. Today started out rainy and cold, but it soon turned into cloudy and cold. It rained yesterday and last night. So far this month, we have had 5.56 inches of rain here at the house. The puddles in the yard are starting to worry me because with all this rain, I’m afraid things will start to die. I do have most plants in raised beds, but with all this rain even that does not sometimes help. I couldn’t get out to do any kind of garden puttering – not even to just walk around and check things out. When it remains cloudy and cold all day, all I can do is look at pictures like the one below and remember what the garden will soon look like. Tomorrow is forcast to be sunny and warmer. Maybe I’ll be able to get out and at least take some pictures. A few years ago, I bought a Nun’s Orchid. It was blooming when I bought it, and it has bloomed every year since. At first it only put out one stalk, but last year it produced two stalks. This year it started showing the bloom stalks in mid November, which is very early. There are three stalks showing, and they now are about 5-6 inches high. When it blooms the stalk is about 28 inches high. I keep the plant on the front porch and bring it in only if freezing temperatures are predicted. It usually starts to show a bloom stalk in mid March but this year it was so early that I wonder if it has anything to do with global warming. I have read that it blooms in relation to day length. Maybe the warm weather we had in October and November confused it so that it thought it was April. I fertilize it after it finishes blooming. Nun’s Orchids are heavy feeders. 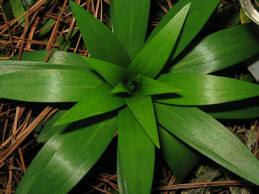 This is a terrestrial orchid, not an epiphyte. I have never repotted it because when my sister repotted hers it died, and I am afraid of losing mine. I know I need to repot the thing, but I am not quite sure what to use. 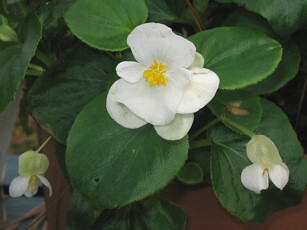 What I have read about this plant says it need well draining soil. I probably will try and add some perlite and maybe some fine bark orchid mix to see if I can duplicate what is now in the container. A Nun’s Orchid is not like the epiphyte ones. This plant gets fairly big. Mine is in about a three gallon pot. They also have nice bright green foliage. 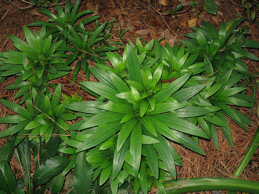 It resembles the foliage of an aspidistra. This is good so that even when it is not blooming, it makes a nice plant. I have been trying to take a picture of this plant for three days, but the weather will not cooperate. We had rain again today, so I just could not get out to snap a photo. So if you would like to see a photo of one, just click on the link above. I will try to post a picture soon. It was rainy and cold again today. The kind of day when all you want to do is stay indoors curled up in a blanket with a bowl of hot soup. The ground is awfully soggy. I could only take a quick walk around the garden this afternoon. There is going to be another freeze here tonight. Even though it is not supposed to be a hard freeze, I did cover up most everything again. The temperature today was not that low (42), but with the rain and the wind, it felt like it was much colder. We have had almost 5 inches of rain in the last two weeks. I know that come July, I will be wondering where all the rain is. But, right now, we have had enough. When the weather is as rainy as it has been lately, you really understand about good drainage for plants. I garden where the soil has a lot of clay. As I have started garden beds, I have added garden soil to raise the beds and also add compost. Each year after that, I add compost, and lately I have started adding a thin layer of soil. Since south Louisiana tends to get a great deal of rain at once instead of a little all year long, I’ve learned drainage is a must. The drainage also helps with fungal diseases. When the occasional deluge does come down, I have lost some plants to “the rot” as I call it. I now plant things that are more adaptable to this climate. 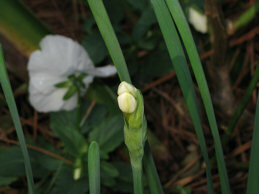 Louisiana irises and calla lilies, for example, are plants that can take the water. If it is a plant that doesn’t like sitting in water, like dahlias, I make sure to plant them high in a raised bed. So far I have been lucky, and have not lost any since I have been doing that. Powdery mildew can also be a problem here. After a few bouts with this, I realized I needed to make sure there was good air circulation around the plants. Also, esp. in the summer, overhead watering is to be avoided. I found that out the year my hydrangeas had a severe powdery mildew problem. Since I do not like to use any sprays, the plants looked pretty poor for a while. To help combat this, I use soaker hoses now. Tomorrow is not looking too good, but Saturday does hold some promise of better weather. So to try and put a positive note on this cold, rain day – I can look at gardening books and dream, I have a good excuse for not weeding, and at least there are no mosquitoes. The winter time really shows where improvements need to be made in a garden. It is said that one of the most important elements to an attractive design is the garden’s “bones”. When people first start designing their gardens, they often do not think so much about the permanent things like evergreens, benches, arbors, etc. I was no different. The first spring and summer everything looked great. There were a few perennials and many annuals to fill in the empty spaces. 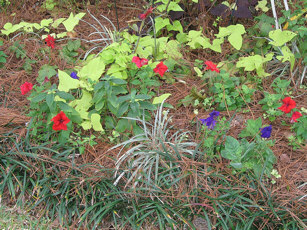 Then the autumn and winter came, and there were practically empty beds with just mulch and a few small evergreens. I quickly realized I needed “something” – especially for height. One solution was an arbor. My daughter gave me a cedar one for Christmas. We put it up in the early spring on the side of the house in an opening between a row of azaleas and a yew. It was just what was needed. The next year I planted a white Lady Banks rose on it, and placed two urns with purple fountain grass in front of it. This lasted about two years, and then in 2005 Hurricane Katrina came through. I had moved the arbor up next to the house to try and protect it. This proved to be ineffectual. A pine tree was knocked down and hit the arbor. It was crushed, and I was crushed. 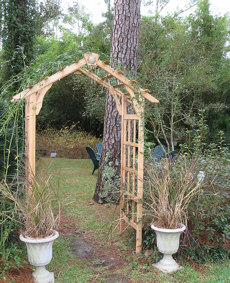 With all the more pressing things going on after Katrina, replacing the arbor was low on the list of priorities. In the spring of 2006, the quest for a new arbor began. I never could find one I liked, or the ones I liked were very expensive. I searched all the garden and big box stores. I went on the Internet. Still no luck. Then for Mother’s Day 2007, my daughter came through again. She found one on the Internet identical to the one she had given me earlier. The new arbor is pictured above. Soon the rose was tied to it, and the urns were placed in front of it, just like before. Now, that side of the yard looks even better than before. After getting the first arbor, I realized how much I had to work on the bones of my garden. After about four years, things are looking better. I’ve put in more shrubs, small trees, benches, and paths. Now, if I can just find a replacement for the arbor in the back yard that Hurricane Rita took out…..
Monday, I was sweeping the patio, and something caught my eye. 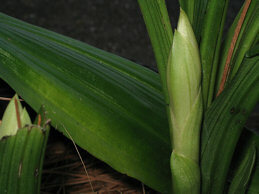 The plant was a bright spring green, undamaged by the recent cold snaps, and about nine inches high. I walked over and saw it was some kind of lily, and there were three of them! Now the Easter lilies, that I planted for the first time last year, are in the side garden, so I know I didn’t plant any of those by the patio. I was puzzled. I kept touching the leaves. I kept racking my brain. Where did those lilies come from? Was I losing my mind? Were they planted by previous homeowners, and now, after 30 years just showing up? Then it struck me. Last year when I was making a spring wreath for the front door, I wanted a small watering can to put on it. The only one I could find had some bulbs for a kid’s garden in it. There were some liatris, gladiolus, and lilies. The bulbs were kind of dried out and not so great looking, but I just stuck them around the garden and forgot about them. They didn’t do anything that I can remember. I figured they rotted or died. I always keep the tags that come with the plants/bulbs I buy, so I went looking for this one. I found out that the lilies are supposed to be lily trumpet Triumphator. I do not remember the plants even coming up last year. Not all lilies do well this far south with our high humidity, and wet summers, so I have not had any experiences with them. I didn’t know they could survive low temperatures without protection. Last year’s Easter lilies were the first I’ve ever grown, so it will be interesting to see if these “surprises” bloom and to see what they look like.